Eric Leonardson is a Chicago-based composer, radio artist, sound designer, instrument inventor, improvisor, visual artist, and teacher. He has devoted a majority of his professional career to unorthodox approaches to sound and its instrumentation with a broad understanding of texture, atmosphere and microtones. Leonardson has been active in Chicago’s experimental arts, sound, improvised music, and performance communities since the early 1980s. Leonardson co-founded the Experimental Sound Studio where he coordinated Sounds from Chicago, one of the city’s first internationally broadcast radio art programs in the late-80s and early-90s. In 1995 Leonardson co-founded the physical theater company Plasticene in which continues to compose and design sound. He is a founder and Executive Director of the World Listening Project and founder of the Midwest Society for Acoustic Ecology. 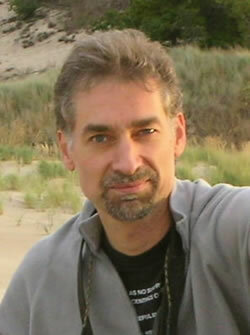 Leonardson is an Adjunct Associate Professor in the Department of Sound at The School of the Art Institute of Chicago. Chicago 1550 North Milwaukee Avenue between 8-11p.m.